Shmuel Dresner was born in Warsaw, Poland in 1928. He was twelve years old when he and his family were forced into the Jewish Ghetto. After attempting to escape, he was caught and held as a slave labourer at Buchenwald, and then at Theresienstadt. At the end of the Second World war, with the aid of the Central British Fund for German Jewry and the agreement of the British government, Dresner came to England as a refugee in 1945. He settled in Windermere and spend four years in a medical sanatorium, where he first began to paint, partly as a form of therapy. In 1949 he enrolled at London’s Heatherley School of Fine Art, before studying at the Central School of Art in 1953. In 1956 he moved to Paris and attended the André Lhote Academy, all the while searching for a visual ‘language’ in which to respond to his experiences. 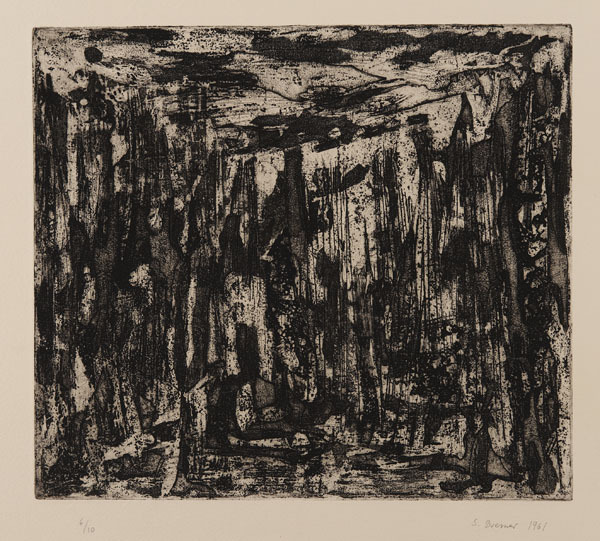 Dresner exhibited extensively between 1955-1981 including a number of solo exhibitions. His work features in numerous private and public collections in Great Britain, the United States, Germany and Israel.